Man carries horse on his back for 3 miles after it was bitten by a snake. Fortunately, the horse and the man both survived. A man carried his horse for three miles after it was bitten by a venomous snake. A message in circulation on social media sites and Twitter claims to show in video a Man carries Horse on his back for 3 miles after it was bitten by a Snake. Fortunately, both the horse and the man survived, it adds. It is a fact that the man carries horse on his back, but the rest of the claims in message are not true. What you see in the viral video is a feat of Ukrainian ‘Superman’ Dmytro Khaladzhi, a former circus performer. 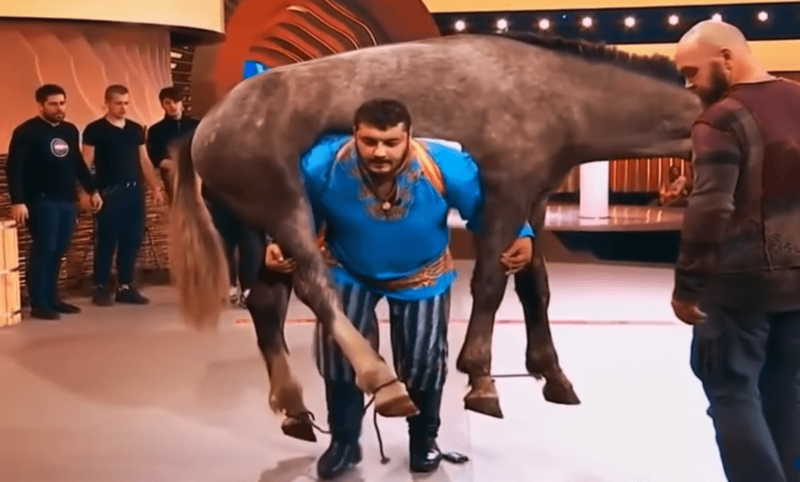 Born in April 1979, strong man Khaladzhi can carry a fully grown horse on his back, bend metal rod with his teeth, and also take a truck over him. He displays various such feats just to prove how strong he is. Dmytro Khaladzhi, allegedly, has several records to his credit. In 2009, he was in fact the champion of the 1st Championship of the Ukrainian Drug-free Powerlifting Federation (in bench press). In the video below you can see some unusual feats of Dmytro Khaladzhi. As you can see in both the instances of carrying a horse on back, the man could do it only for brief period and distance. So, the part of message about venomous snake bite after which the man carries horse on his back for 3 miles is certainly a hoax. On social media, the fabricated story is frequently attached to the video showing unusual feat in order to make it interesting and viral.